Which Bear Canister For Food Storage Should You Use? Which bear canister you choose to carry on a backpacking trip for food storage is an important decision. But there is no one-size-fits-all answer to the question "Which bear canister is best?" And if you think you can hang your food and not have a problem with bears (as well as raccoons and other critters), be aware of the fact that some bears don't seem to understand that they shouldn't be able to outwit your system. The odors of your food, garbage, toothpaste and sunscreen are freely available to them up in that tree. They take it as a personal challenge to get to those yummy snacks, using all sorts of innovative approaches. As a veteran of the tree-hanging stuff sacks method (that's all we had in the 1970s through 2000), I can say that a canister is much, much easier to handle at the end of a long day on the trail. And having your food stolen or rendered unpalatable by bear saliva, well, that could put a big dent in your backpacking plans in a hurry! Some premier backpacking destinations such as in national parks require the use of an approved canister. Look at this list of allowed canisters in the Sierras as an example. Enter the (mostly) fool proof world of bear resistant food containers, including canisters for storing food. To keep the human food you need to fuel your body on a backpacking trip out of the clutches (and stomachs) of the local bear population. And to keep your camp safe from grumpy bears. They are universally hungry and not known to ask politely before poaching your food supply. You can outsmart a bear, but you can't outrun one (don't even try). Keeping these facts in mind, bear canister designs offer you options for doing the outsmarting, as well as fitting into your backpack and camp routine. Hence, the round, thick plastic design for a bear canister. The material used to build the canister needs to be extremely strong, which is why polycarbonate is used. I've personally sat on these canisters for days on end eating meals, and they held my weight easily. Note: They are not comfy chairs. Use a fleece jacket under your bottom to ease the pain. I've seen these bear canisters tossed and rolled around at camp, without denting or cracking. And while I've never had the scary experience of watching a big bear kick around a canister, I can imagine that it would be frustrating for them. There's no place for teeth or claws to grab onto the canister. And polycarbonate probably doesn't smell all that great, either. Use it to store your food and scented items, including clothing you've worn to cook in if you're using a stove (lots of odors get trapped). The lids can be stubborn to remove. Take your time, and don't force them. More bear deterrent tips and information on using BearVaults to protect your food can be found here. If a large round canister seems too bulky, or too heavy, for your backpacking plans, you might have other options if your travel plans don't take you into regulated territory. The Ursack (ursus = bear, right?) is made of puncture-resistant fabric, designed to deter a bear's teeth and claws from getting at your food. But odors are still able to waft their way to a bear's highly efficient nose, so some sort of liner (aluminum or plastic) is recommended. In my opinion, it's the odors that should be defeated. If a bear isn't attracted to your campsite, you won't have to worry about your food. Which is why you absolutely must keep attractive odors out of your tent! Smelly socks, body odors, stinky hair - no problem!! Toothpaste, deodorant, sunscreen - into the bear bag or canister it must go, each and every time. So if you use an Ursack, don't skimp on the liner. Make sure it can stand up to rough usage and water. A leaky liner will spill odors, defeating the goal of remaining bear-less in the backcountry. Some parks and destinations provide heavy bear-proof storage lockers, making the need to carry your own bear vault unnecessary. Others have metal cables (think flag poles) for hanging food bags well out of the reach of bears. As long as your backpacking trip is entirely within their jurisdiction, your food should be safe using these storage options. But if you're reluctant to camp where lockers or cables are provided (for privacy and solitude), you'll need to safeguard your food, and yourself, by making your food and garbage inaccessible to the wildlife. Make it Job #1 to keep a clean camp, segregating all odiferous foods and supplies well away from your tent. Bear canisters are great for this purpose! Just be sure they are far away from your tent. Most folks recommend 100 yards. Your choice, but personally, I'd rather have a bear feasting party far, far away from me in the middle of the night. Make sure you know what that distance looks like before you get out there, and stick to it no matter how inconvenient it might be. 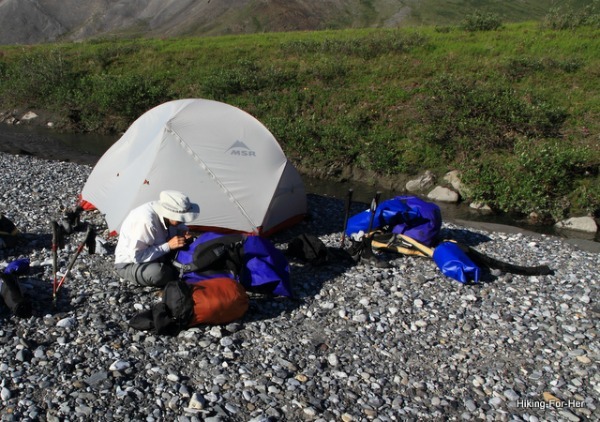 And cook, eat and clean up around the canisters, not your pristine tent area. You'll spill food without even realizing how tempting it will be in the dead of night. Set up your tent well away from your camp kitchen. The black bears living in the lower 48 States are not seen as aggressive enough to require hikers to carry bear spray. The main goal of land management agencies is to keep food out of their awareness, so they don't habituate and become nuisance bears. Hikers in iconic hiking territory like Yosemite National Park? Black bears might be a problem. To get the most current information on black bears throughout the U.S., consult this list of hiking areas. Bear spray is designed for deterring a charge or attack by Ursus horribilus, the species of brown (grizzly) bear not found in large numbers in the lower 48 United States or Hawaii. Pacific Crest Trail hikers completing their northbound route in the fall have the highest, although still vanishingly small, chance of running into a grizzly on the trail. Alaskan and Canadian hikers need to be familiar with when and how to use bear spray. Read more about brown bears and the use of bear spray here. Where there are bears, there are hunters. Every year, bears become prey during hunting season. Read these tips to keep yourself from becoming prey while hiking during hunting season.